VietNamNet Bridge - With 55.1 packs of instant noodles per person per year, Vietnam ranks 2nd in the world in consumption of instant noodles, behind only South Korea, reported the Ministry of Agriculture, Food and Rural Affairs of South Korea. As reported by this Ministry, each Vietnamese eats 55.1 packs of instant noodles per year, compared to 76 packs/person in South Korea. Indonesia and Thailand rank third and fourth. The instant noodle market of Korea reached $1.64 billion in 2014, with 78.7% belonging to Korean traditional product ramyun. The increase of instant noodles in Korea is explained by the rise of one-member families in this country. 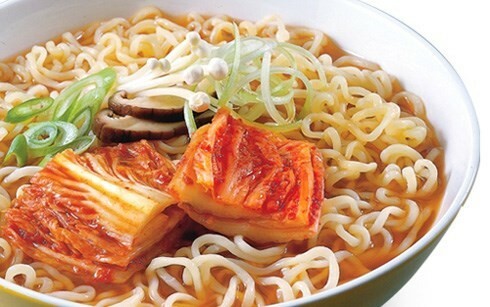 It is estimated that last year South Korea consumed about 816,000 tons of instant noodles. Korea also exportd instant noodles worth approximately $320 million last year. The global instant noodle market grows about 3.1% per year since 2007, although in the past 3 years, the growth rate has slowed. According to a 2014 report by the World Instant Noodles Association (WINA), Vietnam was the world's fourth-largest consumer of instant noodles, behind China, Indonesia and India, purchasing roughly 5.4 billion packets yearly. However, when ranked on the basis of per capita consumption, it came third behind South Korea and Indonesia. A Vietnamese person consumed an average of 56.2 packets per year while the figure for a Chinese person stood at 36 packets. Vietnam's instant noodle consumption has grown at a consistent double-digit rate and demand continues to rise in both urban and rural areas. In Vietnam, the demand increased by nearly 24 percent in 2008-12 while the rate stood at 3 percent in China and Indonesia and 5 percent in South Korea and Japan for the same period. According to statistics from the Ministry of Industry and Trade, Vietnam is home to around 50 domestic and foreign-owned instant noodle producers and manufacturers, with a combined yearly output of nearly 50 billion packets. Major companies such as Vina Acecook and Asia Foods dominate Viet Nam's instant-noodle market. Vina Acecook currently claims 50 per cent of the market share, followed by Asia Foods with more than 20 per cent and Masan with approximately 10 percent. Smaller businesses own the remaining 20 percent. The food processing industry provides a wide range of instant products, including vermicelli, rice paper, and plain rice soup. Supermarket instant noodle prices range from VND2,500 to tens of thousands of VND per packet. The Vietnamese food processing industry exports its instant products to the United States, Australia, France and Germany. Canada and Eastern European markets of the Czech Republic, Slovakia and Hungary also provide a market for these products.